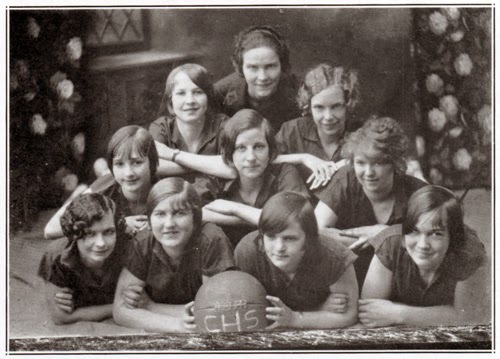 Shown here are members of the 1927 Chadron High School girls' basketball team as they were featured in the CHS "Milestone" yearbook of 1928. The caption noted that their final season "…was very successful, inasmuch as this was the last time a girls' basketball team would represent the C.H.S. at any contest…in January 1927 the state board of athletics made the ruling that after the close of the present season, girls' basketball would be prohibited within Nebraska." These girls, who were not identified, made one long trip into "the wilds of Wyoming and were defeated in three out of four successive games." Nonetheless, this team was a contender for Western Nebraska Championship, which they lost to Harrison. Although it took more than half a century, girls basketball came back to the Cornhusker State -- with a vengeance! And during the 2013-14 season two Dawes County girls' teams made it to Lincoln for the state tournament. Although the Chadron High Lady Cardinals lost to the Pierce girls, they could take solace in the fact that Pierce went on to win the state championship for the second year in a row. And the girls from Crawford High School also made the trip to Lincoln, losing to Giltner 58-39. By all accounts, the Lady Rams may back in contention again next year, since they'll lose only one of their players.